The S&P 500 has had a 50 point run in a straight line and I would not chase this strength. But I would not go short either. 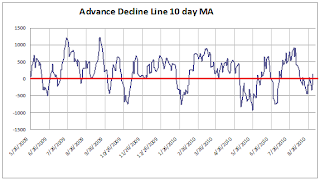 The market is not yet overbought on a short term basis as you can see in the chart below. 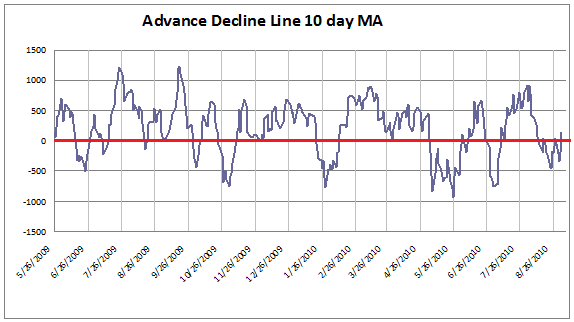 Below are the numbers we will be dropping for the next ten days off of the 10 day moving average of the NYSE advance-decline line. As you can see we will be dropping negative readings for the next three days so the market will not be overbought until the end of day on Wednesday of next week at minimum. The reason I say at minimum is because after that we will be dropping choppy numbers for a few days and its possible that the rally can last into the week of expiration, although I doubt it would make much more headway if it managed to rally through Wednesday.